Over the past three and a half years, a study was performed to gather information surrounding speeding tickets written by State Patrol officers in Minnesota. Precisely 224,915 tickets were analyzed. See what the study reveals below! 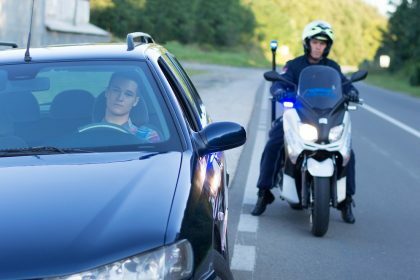 How fast were most drivers who received speeding tickets going? For a 70mph speed limit, officers usually lowered the limit at which they began writing tickets to 10 miles over because “80 miles an hour is very fast,” Trooper Jack Tiegs reported. Officers will occasionally write or cite drivers as going slower than they were actually going depending on several factors like driving history and demeanor. The average speed for which drivers were ticketed was 16 miles over the limit. Keep in mind that outliers on both sides (only a few miles over and more than twenty miles over) affect this average! What time of day were most speeders ticketed? Drivers are most likely to be issued tickets during off-peak hours, usually during the 10 o’clock hour and between 1 pm and 3 pm on weekdays. On weekends, more tickets are between 4 pm and 6 pm. Troopers report that it’s harder to enforce speeding laws during rush hour. Most tickets are written on the weekend—Friday, Saturday, and Sunday. What are the demographics of the people most likely to receive tickets? At all ages, men receive 50% more tickets than women. In Minnesota, men over 55 get more than twice the number of tickets as women. What factors affect whether or not the officer wrote a ticket? Troopers usually stopped either the fastest of a set of cars speeding down the road or—if they were all traveling at the same rate—the car in the rear of the flock. Troopers often get two or three speed readings before stopping vehicles. Troopers look out for evidence of firearms and pay attention to passengers in the car. A camera on the dash of troopers’ cars records the pull over, and a microphone on the trooper’s person records the conversation. Troopers watch for how friendly and polite the speeder is. Troopers report that “attitude and demeanor” are factors in issuing a ticket. Troopers also consider your past driving history. How strictly are speed limits on 1-35E enforced? Speed limits are strictly enforced all along 1-35E, but nowhere is speeding enforced more aggressively than along the stretch of 1-35E that has a 45 mph limit. Of about 1,000 tickets on the 45 mph section of I-35E, 19.3% of drivers were going 55 mph or slower, the limit along the rest of the highway. Only 3.1% of tickets throughout the state were for going 10 mph or less over the limit, but far more tickets were written for going 10 mph or fewer over the 45 mph limit. How many more tickets are State Patrol officers writing now than they used to? State Patrol officers in Minnesota are writing 80% more tickets than three years ago. This is not to fill quotas as Minnesota patrol has no quotas to fill. The officers these days are focusing on enforcing: speeding laws, distracted driving laws, and seat belt safety laws. There are peak seasons for writing tickets. More people speed in the summer, and there are federal grants that fund speeding enforcement in the summer. Based on the information gleaned from this study, how can I avoid getting a ticket? Obey the speed limit. Don’t speed! If you do speed, keep it 10 miles or fewer over the speed limit. Be more careful of your speed on weekends and the middle of weekdays as this is when most troopers are patrolling. Be aware that young people, and especially young men, are more likely to speed. If you’re young or a young man, watch your speed, since troopers will be expecting to have a reason to write you a ticket. Don’t go even 5 miles over the limit while driving on the 45 mph section of I-35E. If you’ve had previous tickets on your record, don’t expect a break! You’re even more likely to be ticketed again. If you get pulled over, be extremely cordial and respectful! Have you fallen into one of these categories recently? Consider erasing the bad taste (and driving record points) with a defensive driving/traffic school course. We’d love to help, it’s kinda what we do! Study information taken from: Carson, Sophie and David Montgomery. “We Crunched the Data. Here’s How to Avoid Minnesota State Patrol Speeding Tickets.” Pioneer Press. 11 Aug. 2017. www.twincities.com.